This garden is located in the costal northern Wollongong suburb of Wollongong, on a low ridge and midway down a slope. When I saw the garden for the first time it was directly after the new house had been built, lawn, new soil and mulch had been installed already. The garden was planted out on a very wet rainy day in the Spring of 2015. There are 5 separate areas to the garden, the first is shown in the images above, it is the front entrance garden, it faces west, the client wanted plenty of flowers and foliage contrast in this area. I have put in two small to medium trees on this side of the house, both to offer shade and also to scale the house with the street as it is two stories and a little imposing. 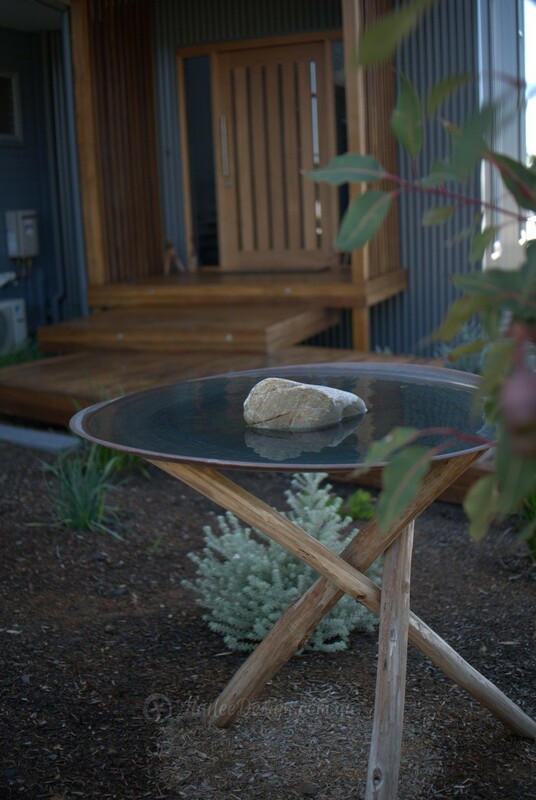 A simple frog pond was installed next to the front door, between the house and the raised decked walkway, we used a plastic moulded off the shelf pond and surrounded it with variable sized river stones. I planted plenty of grasses and reeds around the edges for the frogs to be able to get in and out of the pond. They only took a week to move in. 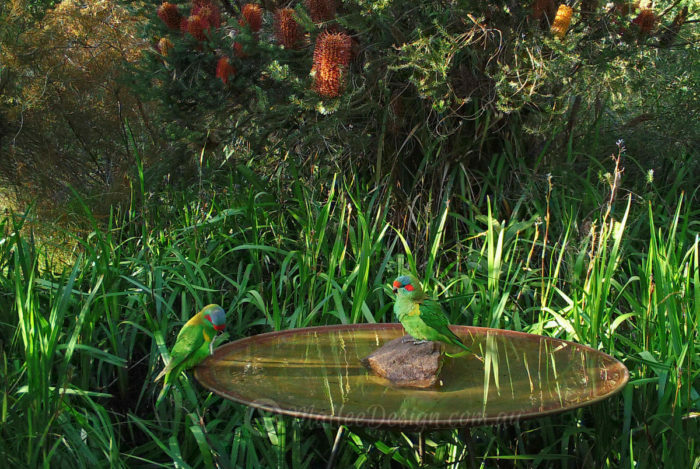 The client also added the copper spun tripod bird bath to the front, placed underneath the Eucalyptus ‘Wildfire’ Grafted, this encourages the local birds to the garden and also adds an extra vertical element. In keeping with the coastal theme I used Eremophila ‘Nivea’ Grafted with Grevillea ‘Winter Delight’ and Westringia ‘Smokey’ for their grey and silver tones. These were mixed in with Banksia ‘Coastal Cushions’, Anigozanthos ‘Landscape Yellow’ and Acacia ‘Mini Cog’. The garden had some drainage issues in two places, this front entrance garden and in the rear running along the northern boundary. We didn’t discover how serious the problem was until a couple of months after planting. It appeared as though there was water seepage coming down the hill into the garden. As the soil had a clay base the water was running underneath the new soil and mulch and over the clay. The client did some clever digging and managed to redirect the run off around the edge of the property and down the side, now everything seems to have settled in well. I used Grevillea ‘Peaches and Cream’ as a low hedging screen along the front boundary, this will be kept fairly well pruned at about 1 to 1.5 metres. It is already filling out nicely after only 6 months and growth in the different areas of shade and sun is quite even. Another Grevillea hedge was planted in the rear and has truly taken off. This is 15 Grevillea ‘Orange Marmalade’ it will create a tall thick screen to about 3 metres if left unpruned. Another area I am really happy with is in the rear next to the out door shower, this spot again gets limited sun and is smack bang up against the house. The clients own two large dogs and are regular beach goers so the shower sees a lot of use. The over flow from the shower is partly absorbed by the garden, therefore the plants need to be tough and capable of surving with saline water. I used Banksia ‘Sentinel’ to create a privacy screen for the shoer and underplanted with Ficinia nodosa and Rhagodia spinescens and they all appear to be super happy.